So I have to say, I was never a fan of this initiative of Disney’s to make live-action adaptations of their animated classics. I mean, I hear some of them are quite good… but definitely never had an interest to check them out. That disposition definitely didn’t change when they announced an adaptation of ALADDIN, one of my favorite Disney movies. Regardless of the quality of the previous adaptations, for me, this would definitely be a high bar to clear, ESPECIALLY when it came to casting The Genie. And I have to say, when EW published pics, definitely didn’t help the argument to give it a chance. Even though the teaser didn’t give us much, we finally got a trailer… and safe to say, this looks AWFUL. Don’t believe me? Check it out below. Much like when STAR WARS fans talk about the prequels, and how they just felt wrong from the opening scroll… definitely got the same feeling here. This whole thing feels wrong. 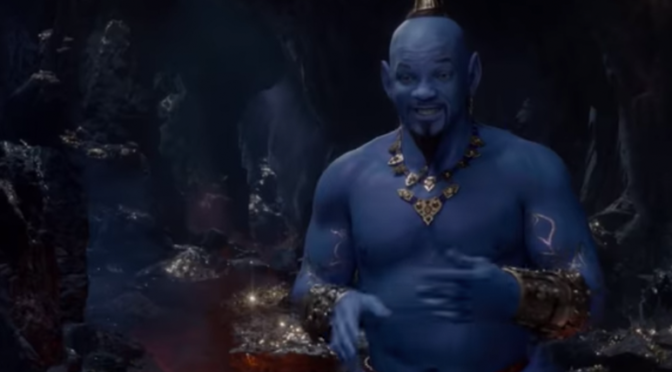 And Will Smith as The Genie? Without a doubt misses the mark of the impression the late Robin Williams left. This one is definitely a pass for me. What to you think about the trailer? Drop your thoughts on the Fuzzybug Facebook Page here.